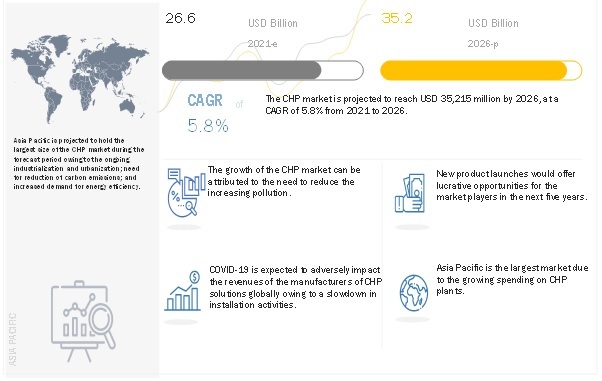 [138 Report Pages] The global combined heat & power market was valued at USD 19.62 Billion in 2017 and is expected to grow at a CAGR of 5.48% from 2018 to 2023. Increasing demand for energy efficiency in the industries and rising use of natural gas for power generation are the major drivers that would trigger growth in the combined heat & power market. This research study involved the use of extensive secondary sources, directories, and databases, such as Hoover’s, Bloomberg BusinessWeek, Factiva, and OneSource, to identify and collect information useful for a technical, market-oriented, and commercial study of the global combined heat & power market. Primary sources are mainly industry experts from core and related industries, OEMs, vendors, suppliers, technology developers, alliances, and organizations related to all the segments of this industry’s value chain. The points given below explain the research methodology. The CHP ecosystem comprises equipment manufacturers, such as GE (US), Siemens (Germany), Veolia (France), 2G Energy (Germany), FuelCell Energy (US), Wartsila (Finland), Caterpillar Energy Solutions (Germany), MAN Diesel & Turbo (Germany), AB Holding (Italy), Capstone (US), Clarke Energy (UK), and MHPS (Japan). 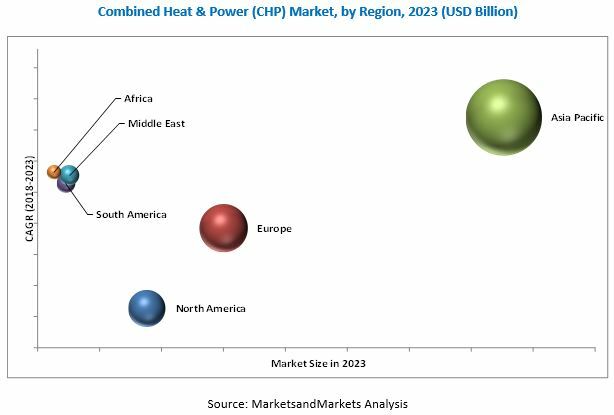 The global Combined Heat & Power (CHP) market is estimated to be USD 20.69 Billion in 2018 and is projected to reach USD 27.01 Billion by 2023, at a CAGR of 5.48%, from 2018 to 2023. The increasing demand for energy efficiency in industries, government incentives, and programs to promote CHP are driving the CHP market globally. The combined heat & power market has been segmented, by capacity, into Up to 10 MW, 10–150 MW, 151–300 MW, and Above 300 MW. The Above 300 MW segment is expected to be the largest because of rise of natural gas fired power plants in Asia Pacific and North America. As most of the coal-fired plants are being phased out, these plants are being replaced with natural gas fired power plants for power generation. The combined heat & power market has been segmented, by prime mover, into gas turbine, steam turbine, reciprocating engine, fuel cell, and microturbine. The reciprocating engine segment is estimated to hold the largest share of the market during the forecast period, owing to the rising distributed power generation in Europe and Asia Pacific. The growth of distributed power generation in Asia Pacific, North America, and Europe is driving the demand for the segment, especially for on-site industrial CHP plants. The combined heat & power market has been segmented, by end-user, into utilities, district heating & cooling, on-site industrial, on-site commercial and residential. The utilities, district heating & cooling segment is estimated to hold the largest market share by 2023. The market for the segment is driven by the transition toward natural gas fired power generation in Asia Pacific and the increasing requirement of heat and steam in industries and municipal townships. The combined heat & power market has been analyzed with respect to 6 regions, namely, North America, Europe, Asia Pacific, South America, the Middle East, and Africa. Asia Pacific is expected to dominate the combined heat & power market during the forecast period. The rise in natural gas in the energy mix in China, Japan, and South Korea along with the increasing demand for energy efficiency is driving the combined heat & power market in the Asia Pacific region. The major factor restraining the growth of the combined heat & power market is the high initial cost required to set up and install a CHP plant, particularly for on-site CHP plants in industries and commercial facilities. The restraining factor is particularly prevalent in the Asia Pacific region. Some of the leading players in the combined heat & power market include GE (US), Siemens (Germany), Caterpillar Energy Solutions (Germany), Mitsubishi Hitachi Power Systems (Japan), 2G Energy (Germany), Wärtsilä (Finland), and AB Holding (Italy). New product launch is the most commonly adopted strategy by top players in the market from 2014 to 2018. It was followed by partnerships and expansions. *Details on Business Overview, Products Offered, Recent Developments & MnM View Might Not Be Captured in Case of Unlisted Companies.